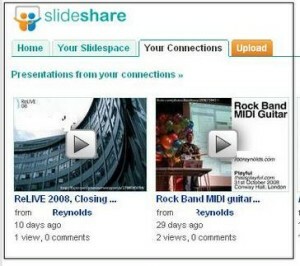 Slideshare now supports its users to embed YouTube videos into their Flash-based powerpoint business presentation. In fact, not just business presentation but any other powerpoint presentation. The newly added tool for business presentations has countless potential features. Users will now be able to include a personal introductions in their business presentations. For example, they may include any video related to their objective available on YouTube and have ease in expressing themselves. The new feature not only allows to include videos in a business presentation but also to edit them in what ever way that is desired. The feature by Slideshare is considerably proving itself to be highly productive when it comes to business presentations. And not to forget, last month Slideshare also introduced and impressive new cloud-based feature that ties your native powerpoint client to your Slideshare account. In all, the new Slideshare feature that allows user to to include YouTube videos into business presentations is a helpful tool. Users can add audio files or even write them on the video included in their business presentation. Other players in this space include SlideRocket, DocStoc, Scribd and SlideBoom. Hello. Great job. I did not expect this on a Wednesday. This is a great story. Thank you!